This post follows on from my previous one on working up my St Ives commission – it’s about how you get from the final 2′ working maquette (opposite) to the finished 6′ sculpture. It is possible to pay others to do this but I felt that I wanted to maintain my ‘hands on’. Additionally I think it’s important that the full scale sculpture is not an absolute copy of the maquette because it is desirable to be able to make subtle changes – for example to take account of the effect of changing perspective with scale. I also wanted to be able to use different textures in the surface treatment – something that wasn’t possible at maquette level. 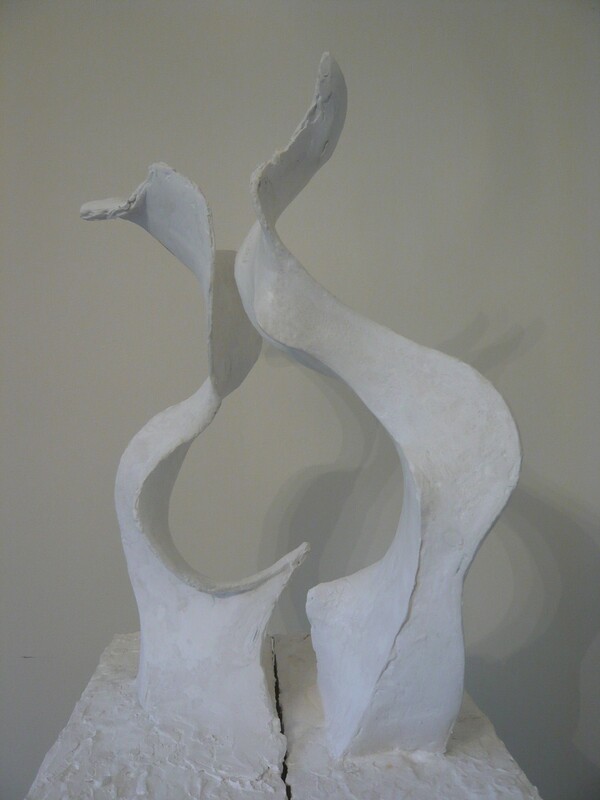 For a sculpture of this type the best way of scaling up initially, to get the major forms in, is to use polystyrene. This is common practice in the film industry and has been widely used by sculptors since it was pioneered by Henry Moore. To get started and also because using a ‘hot wire’ (to cut the huge poly blocks) is a two man job, I enlisted the services of Richard Smith. Richard has had a long career working with Shepperton / Pinewood / Ealing Studios on films as diverse as Star Wars, Quantum of Solace and Sherlock. Under Richards watchful eye my first task was to ‘grid up’ photographs of the maquette and to reproduce at full scale the profile outlines on the poly block. 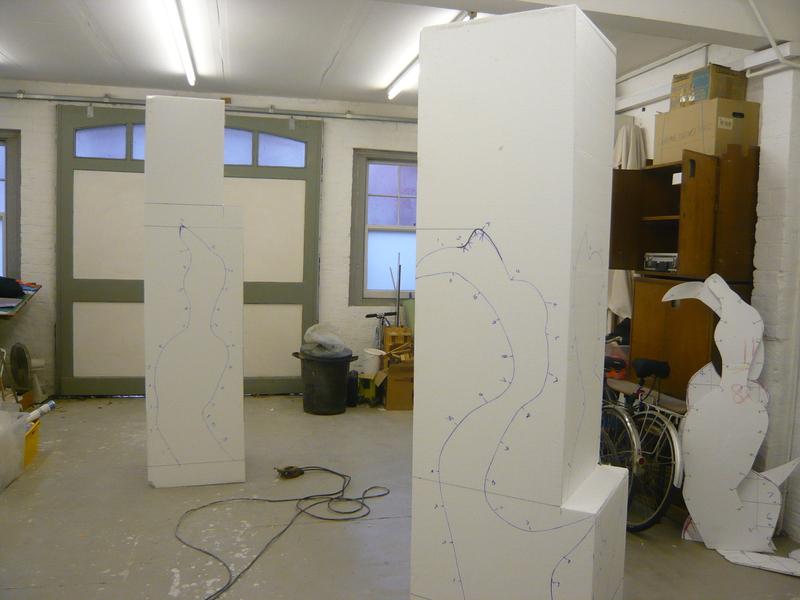 Once these profiles were in place we were able to cut into the blocks to reveal the full size sculptures. 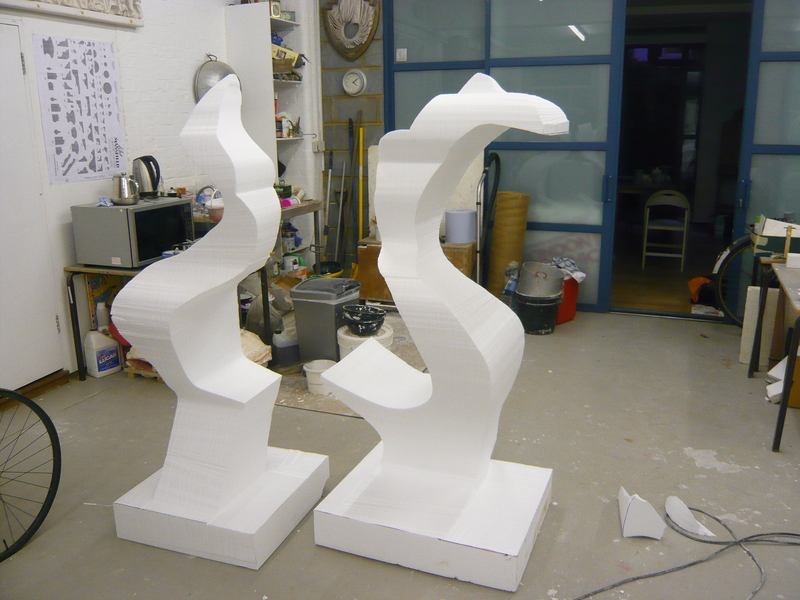 At this point, because only the profiles have been cut, the sculptures are very ‘blocky’ but nevertheless have quite interesting forms (below right). It was then back over to me to begin the process of sculpting into the poly (using saws, knives and wire brushes) to find the detail of the sculptures. 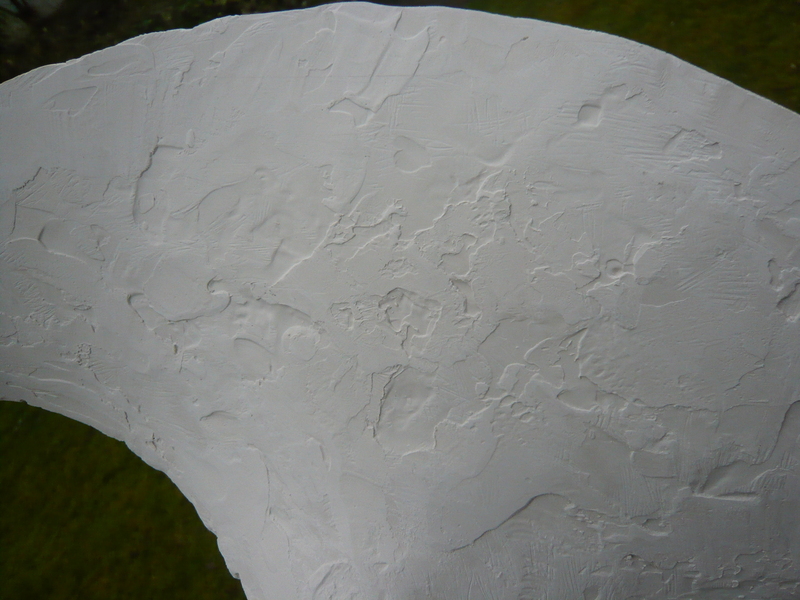 Once I was happy with the basic forms in poly, Cryastacal (a type of very hard plaster) was applied . I guess the poly provides a kind of frame or base for the plaster which itself enables the sculptural details and surface textures to be worked in. All in all a protracted and somewhat labour intensive process, but a deeply satisfying one. 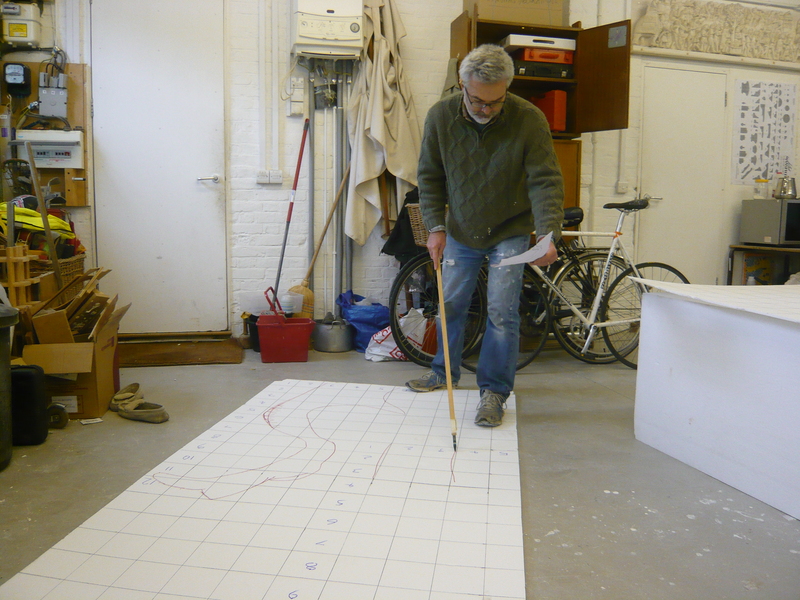 The finished forms are currently being moulded and cast with installation at St Ives set for next month – as you can imagine, I’m very excited and also quite nervous at the same time – watch this space to see how the unveiling goes! Brilliant insight into the process Gary, didn’t know that polystyrene and plaster were used in that way for the scaling up. Whereabouts in St Ives will it be on display? Hi Angela – glad you enjoyed the post. 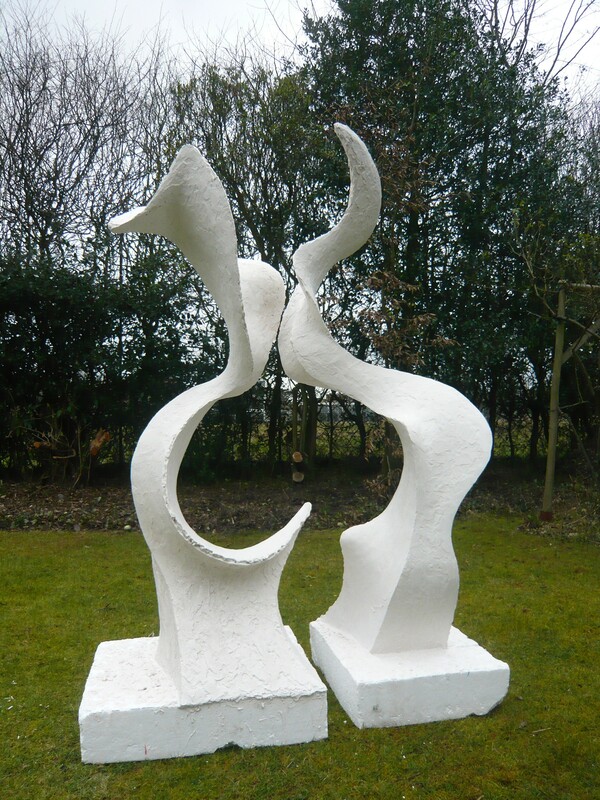 The sculpture will be at the entrance to St Nicholas Court on Back Road East from 10th April.